Pioneers in the industry, we offer biomedical waste sterilizer and pharmaceutical sterilizing machine from India. Our premium quality Biomedical Waste Sterilizer helps the medical care facilities in ensuring proper sterilization of any such waste to maximize public health safety. Our premium quality machine manufactured from the best quality materials help in enhancing the safety of healthcare and sanitation workers, who are responsible for handling such waste. We managed to create a leading position in the industry for manufacturing high quality Biomedical Waste Sterilizer. Proper quality check is done by our supervisors before dispatching it to the end clients. We make this product available at industry best price. Proper packaging is done to make safe shipment. Highly sophisticated Shredder with Hydraulic top pressing arm front lid. Entirely enclosed with no chance of aerosol. Automatic turn around rotation under-load. Elective Hydraulic Motor drive for larger size Shredders. Hydraulic Motor make sure high torque compared to electric drive. Network size variable to shred small or big Bio-Medical waste. Also obtainable without Hydraulic Ram/System. We are the leading providers of superior quality Pharmaceutical Sterilizing Machines used mostly for sterilizing pharmaceutical equipment. Our high precision products are crafted from optimum quality components to ensure great durability, long life and best value for money. We understand the client sentiments. 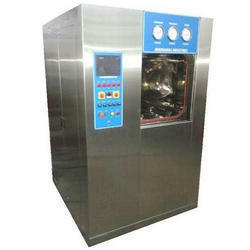 Our sterilizing machines are available in various technical specifications and most reasonable prices. If there is any customized need from the client end we are ready to execute that as customer satisfaction is important for us. No compromise is made on the quality part and things get delivered at an affordable price range. Delivery Time: 15-20 days after receiving PO.